Who drives a white or tanish g35? Looked lowered maybe. I was washing my car atthe car wash by gateway on the southside and they came in the parking lot thinking they were dk or somthing doing donuts in the parking lot. That looks almost like Andy's old supra from waaayyyyy back in the day. Not sure if he ever sold it or not. I used to work with his sister Maria at Citi Group....could be his but then again probably not. Lots of nice rides coming out of the wood work lately. I talked to Andy at the event sunday and he said he still has his supra and evo. I'm not a fan of the bumper. Dude, I keep seeing this guy too. He drives to work around the same time I do. I've been next to him a couple times. Looks kinda like a bigger 30ish something guy. Car sounds very stock so I'm guessing he just slapped the front mount on and called it a day. That Supra does look a lot like Andy's if it isn't. Where does Andy live? 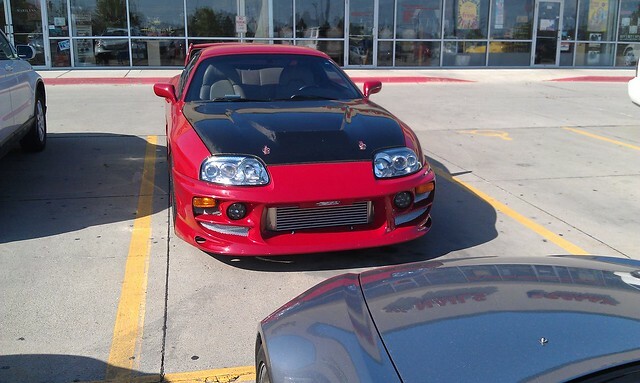 Apparently this Supra is from the Brooke Run area in Des Moines. When I went to Taki with him a few months ago he had told me he sold his supra? There's the add to the red supra. Whoever owns it is trying to sell it right now. I thought the car looked pretty good. Not to often you see a audi with a massive FMIC. I thought Andy said he still had the supra maybe I'm wrong. I don't know about 40k for that supra add. Surprisingly enough the manual mkIV sell like they are gold for some reason. Well due to the great write up on that ad, I'm unable to figure a fair price. I know they are pricey but judging by the looks and lack of write up I'm guessing not much is done. So 25-32 depending on mileage would be close I think. Who's the girl that drives a SSBP Integra?